The charming town of El Rito, north of Santa Fe on El Rito Creek, is situated along the margin of both the Colorado Plateau and the Rio Grande rift. The landscape history of the El Rito area reveals remarkable topographic changes through time. A 2-mile roundtrip hike (easy, he promises!) will take us to the spectacular north rim of Copper Canyon, one of the best, yet least known, vistas in northern New Mexico. We will also visit rock exposures north of El Rito, telling the story of the Rocky Mountain uplift in northern New Mexico. There is spectacular scenery throughout the day, so be sure to bring your cameras. An added bonus for this tour: a chicken fajita lunch prepared by Dr. Kirt himself (‘chef de cuisine’). 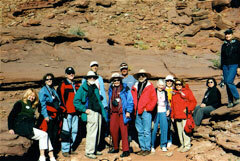 This tour is also ‘required’ attendance for all ‘Southwest Seminars survivors’ of the memorable South Rim Copper Canyon tour! Modest hiking. Includes transportation, gourmet Fajita lunch by Kirt, and honorarium for Study Leaders. $85 pp. Register by April 23. For those of you that have explored the eastern half (the part you see from State Highway 4 out of Los Alamos), of the Valles Caldera, this tour will provide new insight and understanding to the amazing geologic and natural history of the Valles Caldera. Highlights on this day include views of the caldera from the stunning western rim of the caldera, a visit to the youngest eruptive deposits inside the caldera, bizarre formations of Bandelier Tuff, and a geologic overview of San Diego Canyon, the only canyon that has breached the rim of the Valles Caldera. If time and weather allow, a short hike will be included on the itinerary. Tour Conditions: Easy. Includes transportation, lunch and honorarium for Study Leaders. $85 pp Register by May 13. Join Alan Osborne, Southwest Cultural historian for a day trip to Zia Pueblo for feast day dances. These western-Keres speaking and traditonal people have occupied the scenic hilltop village and this rugged region NW of Albuquerque for centuries. 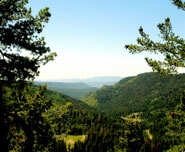 Zia, located beside the Jemez River, is near the Nacamiento Mountains and red rock foothills of the Pajarito and Jemez Plateaus. These lands were the site of hunting gathering and farming communities for many millennia, as this region was populated by different peoples over long periods of time who came together to become those who were encountered by Spanish conquerors, missionaries and settlers. While conquest is an important chapter of Pueblolan history, ‘survivance’ is its modern reality. Some have said the Zia people have retained most of their traditional beliefs and thus absorbed very little influence of our dominant society. The Zia achievements in pottery and other arts and crafts, as well as spiritual tenacity is legendary. Their mission church and plaza are all part of the accommodation and compartmentalization of different but powerful spiritual forces. We will be like trees: silent observers and important witnesses of the continuing strength of culture here today at Zia Pueblo. Tour Conditions: Easy. Includes transportation, nice picnic lunch, and honorarium for Study Leader. $75 pp. Register by July 15. Spend an enlightening day with noted archaeologist, scholar, author and professor emeritus Dr. Linda Cordell, with whom we will be visiting four archaeological sites on the edge of the Galisteo Basin: Tijeras Pueblo, Paa-ko Pueblo, Arroyo Hondo Pueblo, and San Antonio. Each of these is representative of different ways Ancestral Puebloans built 14th century communities. All four pueblos were constructed of adobe and noted scholars excavated each to different degrees during the 20th century and today visitors see low mounds of earth. With maps, photographs, and Dr. Cordell’s interpretation, we will walk each of the sites to understand their similarities and differences. Arroyo Hondo was composed of 1,000 rooms arranged in 1 and 2-story room blocks and was originally investigated and partially excavated by Nels Nelson of the American Museum of Natural History. Intensively studied by Douglas Schwartz for the SAR, it sits at the margins of the Sangre de Cristo Mountains just outside Santa Fe. It sits above a spring and encloses 13 plazas. Pottery traditions of the village were shared with other puebloans of the Tewa Basin and Pajarito Plateau but Arroyo Hondo appears not to have participated in much broader networks of exchange. Tijeras Pueblo is on the east side of the Sandia Mountains and was occupied, like Arroyo Hondo, from about 1300 to 1425 AD. It is located above a seep, it is bisected by 2 arroyos, and was excavated by UNM field schools in the late 1940’s, and again in the 1970’s, directed by W. James Judge and later Linda Cordell. While much smaller than Arroyo Hondo, with about 250 rooms, it experienced 2 different construction episodes during which the community completely reorganized its space. These Ancestral Puebloans were among the first to produce glaze-paint decorated pottery. Their kivas were of 2 different shapes and construction techniques, and the village maintained 2 different traditions of painted pottery, while participating in extensive trade networks. A new interpretive visitor center there will enhance our experience. While neither Arroyo Hondo nor Tijeras Pueblos remained occupied into the mid-1400’s, settlement did continue at a pueblo in the modern village of San Antonio. Finally, in 1763 AD, a frontier buffer community of Hispano/Genizaro (hispanicized captives) was established there, named San Miguel de Laredo. In the 1970’s, portions of the ancestral pueblo village and the historic San Miguel de Laredo were excavated by the Museum of New Mexico and scholars conducted important ethno historic research. Paa-ko Pueblo also began in the 1300’s AD as a plaza-oriented adobe-walled compound of several hundred rooms. But after more than a century of occupation, Paa-ko ceased year-round occupation. By the 1500’s, a smaller, mostly stone-masonry pueblo was built on-site and occupied into the 1600’s AD. Early Spanish colonial documents mention Paa-ko as an existing village and Adolph Bandelier noted it as a ruin when he arrived in the late 19th century. Major excavation at Paa-ko in the late 1930’s was undertaken by SAR/Museum of New Mexico in hopes it would become a unit of the New Mexico State Monument network that complements Coronado Monument (Kuaua). Recent work there by the U. of Chicago is focused on the historic site. Paa-ko produced glaze painted pottery traded with Tewa Basin and Galisteo Basin pueblos. Historic period occupation seems to have resulted when Galisteo Basin pueblos were under attack, and Paa-ko served as a place of refuge. Includes transportation, lunch, and Study Leader honorarium. $95pp. Journey into the magical Canyonlands and Arches National Parks of southeast Utah and the spectacular Red ￼Rock Country of the Colorado Plateau for an unforgettable five-day experience with Dr. Kirt Kempter, vulcanologist, geologist, former Fulbright scholar, and Alan Osborne, Southwest cultural historian. We’ll spend all four nights at the new and beautiful Red Cliffs Lodge, featuring a popular restaurant and on-site winery and vineyard, as well as beautifully appointed riverside timber lodges with private patios overlooking the Colorado River. It has been said of this area, upriver from Moab and facing Arches National Park across the river: ‘The magic of the river, red cliffs, and pastoral green fields (replete with grazing horses) are three ingredients, that when viewed together, overwhelm the senses.’ Vast panoramas, dizzyingly deep canyons, dramatically steep cliffs, broad mesas and towering spires, sliced into districts by the Colorado and Green rivers, this is a world-famous photographers’ paradise and land of extremes, described in expressive literary terms by some of America’s most eloquent writers, including Terry Tempest Williams and Edward Abbey. Includes morning 4×4 excursion along the Schafer Trail into the Canyonlands with local guides and a half-day guided river trip by motorboat through a spectacular section accessed by the river, with picnic lunch and visits to ancient Indian petroglyphs and cultural sites along the way. Not only spectacular vistas, but also wildlife, including bighorn sheep, are always a possibility for sighting and photographing on this memorable day. 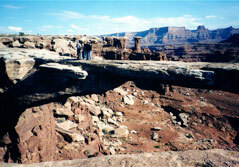 We’ll spend another full day to marvel at several Canyonlands scenic overlooks from the rim above the river, including Mesa Arch and Dead Horse Point, featuring walks/hikes to unforgettable views of a vast panorama of rugged red rock landscapes, appreciating the beauty of the region we passed the day before deep in the canyon below on our excursion along the river.